There is virtually nothing in print about the Rossi Princess revolver. It does not appear in the Bluebook of Gun Values or the Standard Catalog of Firearms. I could find no mention of older Rossi firearms, such as the Princess, on the company’s U .S. or Brazilian websites. 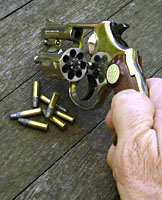 I find the gun first listed in Gun Digest in 1966, where it is described as the Rossi Ladysmith, imported by Benet Arms. Most examples I have seen are stamped FIREARMS INT’L CORP., WASHINGTON, D.C. Rossi firearms were later imported by Interarms, but I don’t believe they ever imported the Princess. 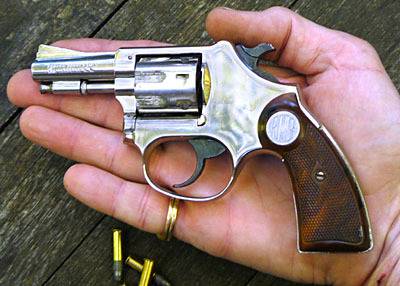 Externally the Princess is a copy of the third model Smith & Wesson Ladysmith, but the lockwork is quite different. It has coil springs instead of flat springs and features an Iver Johnson-style transfer bar and a rebounding firing pin. Pete Dickey’s article in the September 1982 issue of American Rifleman states that the Princess’s frame is die cast from “Zamak,” a zinc-based alloy which incorporates aluminum, magnesium, and copper. Zamak is often denigrated as potmetal. However, it has been pointed out to me by an engineer friend that Zamak is a family of alloys and that the strongest one, Zamak 2, is substantially stronger than commonly-used high strength aluminum alloys. The barrel has a steel liner and the cylinder is made of steel. The Princess was manufactured from 1957 through approximately 1985, but was only imported into the United States from 1965 through 1969--another victim of the Gun Control Act of 1968. From the serial numbers I have seen, it looks as though close to a million were made. * The Princess was available with a 2- or 3-inch barrel, in nickel finish only. 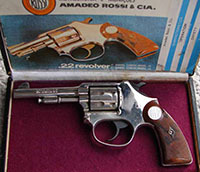 The 2-inch barrel version was designated by Rossi as the Model 25, and the 3-inch barrel version was the Model 13. The model designations are rarely used in the United States. When the gun first hit the U.S. market it seems to have been called a Ladysmith by default, but another trade name was needed for it and some marketing genius decided on “Princess.” A less-macho appellation could not have been had, but I suppose some similar name was inevitable given the gun’s diminutive size and resemblance to the Ladysmith. On the right side of the frame is the early logo, a monogram of the company’s initials, “ARC,” in a circle, with MADE IN BRAZIL above and IND. BRAS. and MARC. REG. surrounding the monogram at top and bottom. There are no import markings. Later guns have the barrel inscriptions reversed. 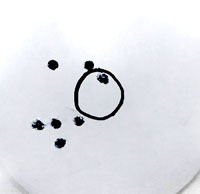 The right side of the barrel is marked .22 L.R. The right side of the frame is stamped MADE IN BRAZIL and features the Rossi logo trademark, the word “Rossi” in a circle, with IND. BRAS. and MARC. REG. surrounding the circle at top and bottom. Beneath the cylinder on the right side is the importer’s name and address: FIREARMS INT’L CORP., WASHINGTON, D.C. The grips are cheap checkered plastic with the Rossi name in a circle at the top. I have noted later guns with the one line AMADEO ROSSI & CIA inscription given above on the left side of the barrel and the right side marked S. LEOPOLDO R.G.S. .22 L.R. The examples of the 2-inch barrel Princesses I have seen all have a ramp front sight, whereas all the 3-inch barrel versions I have seen have a Rocky Mountain style blade with an integral base. I have noted three different grip plate styles--two in brown plastic, one style small (that doesn’t cover the rear screw on the right side) and one large (that partially covers the screw), and another large style in pearlite plastic. I bought my gun from an online auction site and I remember being disappointed in the overall cheap appearance. However, it is more accurate than I thought it would be--in single action mode. The double action is not good. I polished the sides of the hammer, the sear, the hammer stop, and the transfer bar on my gun, and lubricated everything thoroughly, but I can’t say it produced any real improvement in the double-action. I did not attempt to alter the springs, as replacements are not available. I’ve always thought of the Princess as a nearly ideal backup gun--very easily concealed and not much to go wrong. *I would appreciate hearing from anyone who can provide further information about the Rossi Princess. Send me your serial numbers and describe your gun or include photos--my serial number is 69152. Other serial numbers noted: 7180 (in South America), 12551, 41222, 41703, 41903, 73625, 75755, 536232, 550171, 556184, 560323, 591096, 599911, 692712, 699647, 721039, 907790. Copyright 2010-2016 by Ed Buffaloe. All rights reserved. “Rossi Princess Revolver,” by Pete Dickey. American Rifleman, September 1982.